Perfect for Christmas for the Ladies on your list! Wrap yourself or a loved one in this super soft medium weight 100% cotton Flannel (5 oz. per sq. yard). 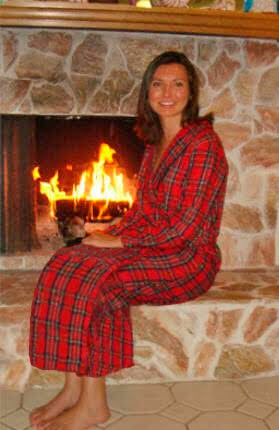 Robe in a Stewart Plaid in 52 inch length features a shawl collar, two side pockets, and belt. Machine wash and dry. 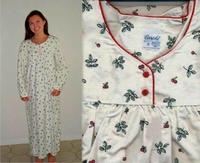 Quality made in the USA of imported fabric. Size 2XL and 3XL are $3.00 more per robe. This plaid exactly matches the Ladies Flannel Nightgowns. Whether just lounging around the house, sitting by the fire, or cuddled up with your favorite book; this Ladies Flannel Robe will be the robe of choice. 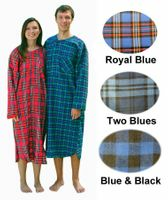 With the longer 52 inch length, this flannel robe is perfect for winter travel and warm enough to keep off the fall chill.